b-l-a-c-k-o-p™ - Q@mera: Q@mera 2.0.4 with High Jammies! Q@mera 2.0.4 with High Jammies! Grab the new Q@mera 2.0.4 with nifty new features like integrated window-contents grabbing. 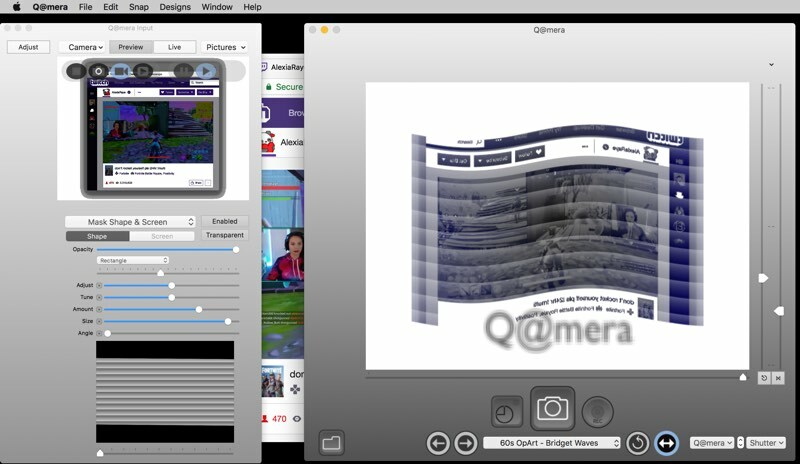 In this screen-capture, see Q@mera 2.0.4 in action: Google Chrome is hosting a Twitch live stream. From inside the Q@mera input panel, we've selected the Chrome window as a camera input. This live video feed (Alexia playing Fortnite) is now running through the Q@mera filter chain live, in real-time. The filtered Q@mera output also appears as a CMIO (AVFoundation) camera input in other Mac camera apps. You probably don't believe us which is why Q@mera is a free download from the b-l-a-c-k-o-p live download horn-o-plenty. Grab it now and report back on any bugsies. By : Ms. Black Q@mera 2.0.4 with High Jammies!